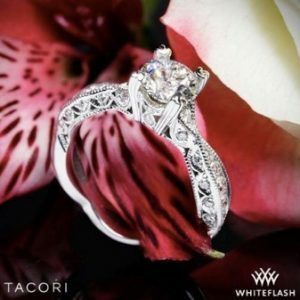 Tacori Engagement Ring Review - Are You Paying More than You Should? With no clue about diamonds, you could be eyeing a complete engagement ring. 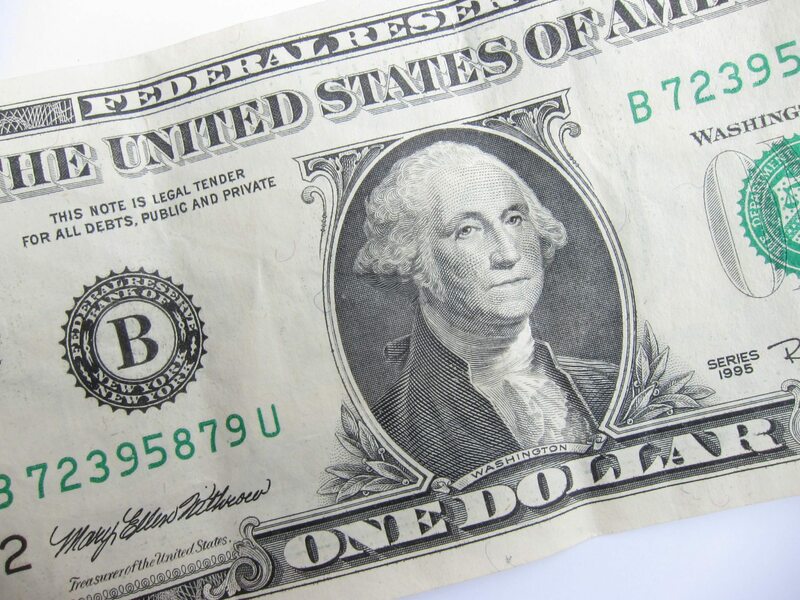 But having learned of the 4Cs, all the focus diverts to the diamond and how you can get the best bang for the buck! And after discovering more, you probably know by now that a superb ring setting can tremendously amplify an already-excellent diamond. A superb diamond paired with a Tacori Designer Ring is like putting a star on a pedestal with the same outstanding caliber. 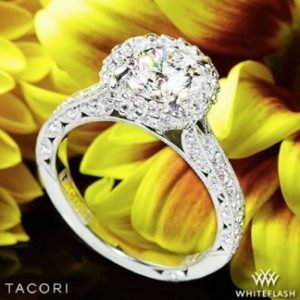 We know both are revered just by the ring of their titles – the diamond as the ultimate symbol of love and commitment, and Tacori as an icon in the designer jewelry world. But like any other brands, we’re here to make sure its popularity and exclusivity are justified! 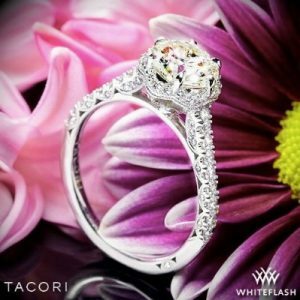 We’ll take a look at the Tacori Ring – why it’s the most sought-after name in the industry. And if it really is your super excellent diamond’s one true match! In 1969, Haig Tacorian immigrated from dictator-ruled Armenia with his wife, Gilda. They found a new home in Glendale, California where Haig would start a groundbreaking company that would forever change the world of fine jewelry design. After four decades of success, he still serves as Tacori’s CEO while his son Paul and daughter Nadine together with other family members uphold the tradition by going beyond modern shopper’s needs. All Tacori jewelry is made in America – handcrafted in California by some of the finest jewelers in the world. The care and attention to detail evident in every Tacori ring is inspired by Haig’s original vision. An uncompromising passion for intricately crafted artisan jewelry truly reflects the family legacy. To achieve utmost quality, the best jewelry designers partner with trusted retailers. So, they can focus on what they do best which is creation. 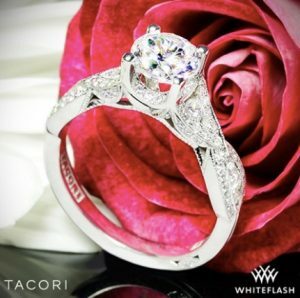 By allowing Whiteflash to handle retail, Tacori is able to keep making one-of-a-kind heirlooms and reflect the Tacorian or Californian essence of anything is possible. Fusing the Edwardian and Art Deco eras, these engagement rings evoke a combination of grace and symmetry. They use elegant filigree and geometric shapes making every piece a masterful blend of the old and the new. 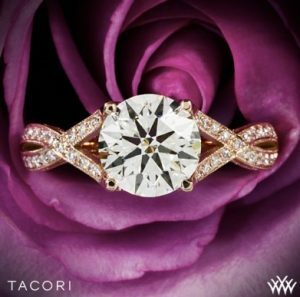 This exquisite artistry with precise science is known as the Tacori Touch. And since each piece is handcrafted by an artisan, you wouldn’t see two rings that look the same. They take pride in producing engagement rings that are individually shaped by a number of experts for innumerable hours! The representation of old and new isn’t just seen in the design, but on the process as well, as the latest technology and human craftsmanship are equally incorporated to achieve their signature look. To further cement their aim for highest quality, they also participate in the Kimberley Process like most top brands that take the ethical road. This means that the diamonds they use in their rings are certified conflict-free and are legitimately mined, sourced, and polished. 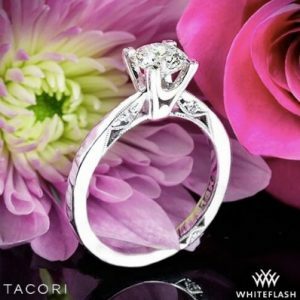 What I like about Tacori is that they have a number of collections with different designs and styles to choose from. So, you’ll see simple wedding rings to intricately-styled engagement rings. And even though the young brides are the inspiration, the Old-European feel also appeals to older shoppers. Below are their 13 collections including the wedding rings and bands selection at Whiteflash. Click each one to know more! 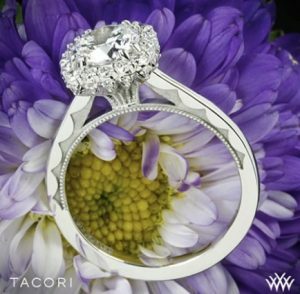 The Tacori Blooming Beauties Collection features accent diamonds surrounding and embellishing the center stone, the like a flower unfolding. 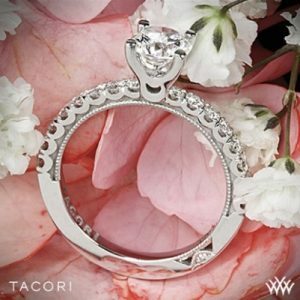 Distinctively Tacori, the Classic Crescent Collection consists of designs that are timeless. 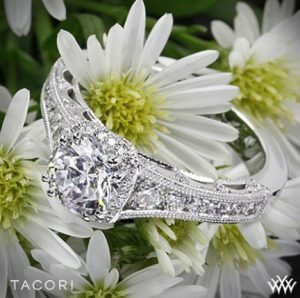 The vintage style crescent design that Tacori is so famous for is on full display. Straightforward and bold, designs in the Clean Crescent Collection feature the Tacori crescent from profile view in clean high polished form. Sleek profiles and flowing lines characterize the Tacori engagement rings Dantela Collection. 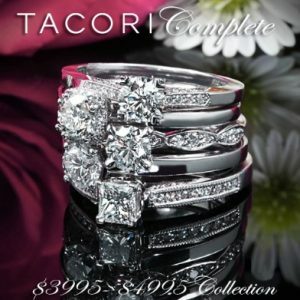 Embracing a wide variety of feature diamond shapes this collection contains some of the most popular new Tacori models. Like a flower in the prime of fulfillment, the Tacori Full Bloom Collection features styles that will make you “stop and smell the roses”! Slim lines and minimalist design elements of the Tacori Petite Crescent Collection elegantly focus attention to the center diamond. The Pretty in Pink Collection features fabulous engagement rings made in rose gold (also referred to as pink gold). The unique composition of this gold alloy results in a warm “blush” color that harkens back to a vintage period. The Tacori Reverse Crescent design features a playful twist on the crescent motif. The Tacori Ribbon Collection, as the name implies, features design elements that flow and merge in curving fluid forms creating a sumptuous and feminine look. The Royal T Collection from Tacori contains some of the most elaborate and decorative designs in the entire line. Models in this collection are neither understated nor subtle. Each one makes a statement that says “Fab-u-lous”! 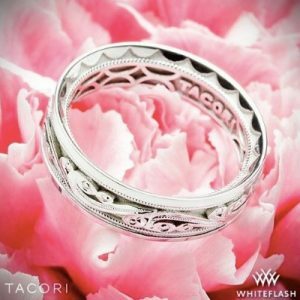 The Tacori Sculpted Crescent collection features models that have a bold profile view of the trademark crescent in solid, high polish form. Unmistakable Tacori engagement rings design elements characterize the Simply Tacori Collection. Micro beading and micro pave crescents adorn each ring from profile view. 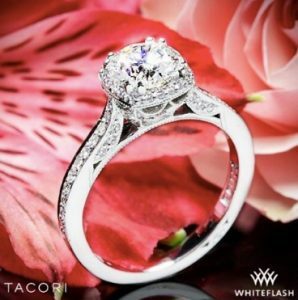 The Tacori 3995 – 4995 Collection is the ultimate answer to the shopper who wants to keep it simple! This collection features five great styles pre-set with a high-quality center diamond. With half carat center diamonds, they come complete for $3995, or step up to a three quarter carat diamond for $4995. Tacori Wedding Rings and Bands are all hand-crafted in California by skilled artisans with incredible attention to detail. Engraving and micro-pavé are on all three sides of these rings which allow the beautiful styling to be seen from all directions. With so many variations to choose from, the main thing I noticed was how the makers have animated each design to best exhibit a diamond’s brilliance – no matter what size, shape, or color. Tacori may not be for you if you’re on a tight budget and prefer a plain band to set your diamond. But let’s be honest, you can’t really put a price on the love for the craft! If you live for custom masterpieces and all that jazz, then their intricate stylings and grandness are very well justified, in my opinion. This one is polarly far from a mass-produced ring! 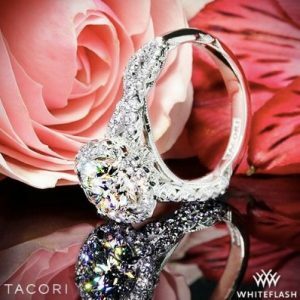 Tacori is a premium designer brand and is still a force to be reckoned with throughout the years. 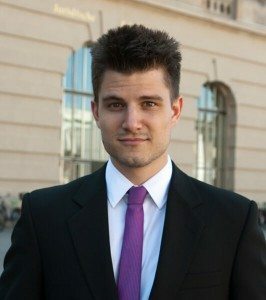 Should you have any question, feel free to email me or comment down below.